When we asked for your 2010 Internet marketing predictions, you told us that local is going to be huge this year. And I wholeheartedly agree. I can’t wait for the day I can simply search for a product on one site and find the best price of an in-stock item at a small business or major chain store near me. But in our fervor for the new opportunities cropping up at a micro level in our own hometown, let’s not overlook the macro possibilities. So today I’d like to take our focus off of local and discuss, well, the entire world. After all, you are reading the MarketingExperiments Blog International Edition. Sounds fancy, and I loved seeing the International Edition of American publications when I was in Montréal (très chic!). But, of course, everything on the Internet is essentially an International Edition. After all, our readers include Stephanie from Canada, Meraj from Singapore, Inna from Germany, Gabriela from Argentina, and Gavin from the UK. How well do you know your audience? 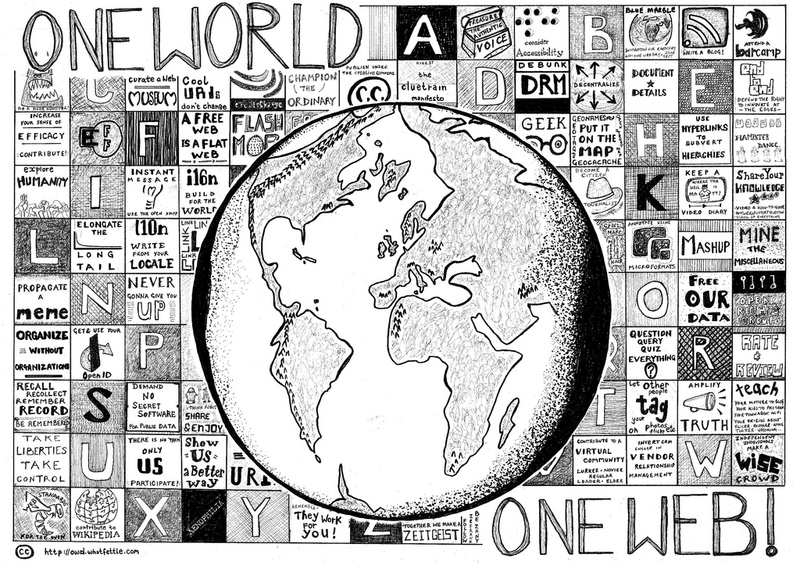 For Americans at least, sometimes I worry we have a view of the world similar to Saul Steinberg’s famous cover for The New Yorker. But let’s not forget that this is the World Wide Web. Your customers are, or at least have the potential to come from, anywhere in the world. Now that the world is your oyster, where should you begin? Most analytics software, such as Google Analytics, will break down your traffic by country of origin (and drill down even deeper than that). Understanding where your current audience comes from can help you shape your message. But don’t just limit yourself to where your audience is coming from today, consider where they could be coming from and think about how you can target content to that potential audience. In addition, if you have an ecommerce or even lead generation site, look at how your traffic compares to actual orders and leads. If you get a big chunk of traffic from a certain nation, yet they very rarely order or become a lead, what in your conversion process is stopping them? While you don’t necessarily need an entire website for every possible language, it is always a good idea to delve into proper segmentation of your current and possible audience. And if you find a big enough potential market, that commonality of language may significantly help your conversion rate. You don’t even necessarily need to look beyond your borders to find that opportunity. For example, according to the U.S. Census, the buying power of Americans of Hispanic origin is projected to exceed $1.2 trillion by 2014. If that segment could generate a significant amount of business for you, you should probably consider testing custom Spanish-language landing pages to see if they are worth the investment. If you do choose to test custom foreign-language pages, keep the word custom in mind. Don’t just settle for poor translations of your current pages, but truly put the time and investment into understanding that segment and its motivations…as you would with any other segment. It’s easy to laugh at these snafus, but if we do not truly understand the cultures of global and bilingual markets we seek to enter, we may be making these same mistakes. We can’t be transparent marketers if our audience doesn’t understand what we’re talking about. And far from welcoming new customers, we may be turning them off to our message. While custom foreign-language landing pages are worth testing if the segmentation is right for your organization, don’t feel like you necessarily need to invest resources to customize your site for every possible language. As French is la langue de l’amour, English is currently the international language of business and the Web (after all, ICANN is still an American organization). As I said above, there is an entire world out there. Just make a right at the Atlantic or a left at the Pacific and you’ll likely find untapped markets. So acknowledge it…as I did in the intro to this post when I mentioned our readers from across the globe or as Boris Grinkot did in a recent post where he simply mentioned regulations to consider in India. The first step to profiting from an international audience is recognizing that you have one. Test how often to mention different cultures and which cultures to mention and see how that affects your traffic. Even better than acknowledging the existence of other cultures, show them that you truly cater to their needs. If you’re looking for some good examples, Israeli websites tend cater to a global audience well (a combination of state subsidies that makes international shipping cheap and the global interest of a nation that holds importance to three major religions). One good example from that country is TheGreatShofar.com. This site clearly illustrates how it serves other parts of the world by, for example, having an American phone number and a testimonial from someone in America right on its homepage (leading us to believe that either America is one of its most important, sought after segments or this is a landing page optimized for Americans). I live in Timbuktu. Will you ship to me? Yes. We ship to Timbuktu as well as Australia, New Zealand, South Africa, China and pretty much anywhere that has a postal service. To find out how much it will cost to ship to your location, just add your desired products to the shopping cart and our shipping estimator will display your shipping costs. One way we try to cater to our international audience is through live training and speaking engagements around the world. Dr. Flint McGlaughlin will next be teaching and speaking about email response optimization at Email Marketing Germany 2010 in Munich from March 8-9, 2010. Register (in English) today. Or, if you prefer, register (in German) today. The practice of aggregating all the films and events that are already available to see and visit reveals a wide mix of cultural activities across all income brackets and across all age groups and across all social and ethnic categories. We list “foreign” films (to U.S. audiences) in every spoken language, form Zulu (Skin 2009), to Romanian (Police, Adjective 2010), to Spanish (Broken Embraces 2009), to Mandarin Chinese (Red Cliff 2009) to French (A Town Called Panic – animation 2009) – all offering English subtitles for access, but of interest here, because there are huge U.S. populations of native speakers of every “exotic” language or dialect, too. We list showtimes for new national digital telecasts of Operas to hundreds of local movie theaters, with English subtitles for access to the French, Italian, German, or “sung” English of opera. We list old silent film showings as well as new animations or films without dialog. New York City has long been known to be the single city with the greatest number of people of Jewish descent, outside of Israel. Los Angeles has more people of Mexican descent who speak Spanish as primary language, than any other city in the world except Mexico City. A suburb of Los Angeles, Monterey Park has the greatest population of Chinese in a city, outside of China. I am very flattered that you referenced our site as an example. I moved from California to Israel a couple of years ago. I immediately realized that there is potential in shipping Israeli products to Christians, and Jews in America who are interested in them. The main obstacle that had to be overcome is making a person in America feel comfortable ordering from someone on the other side of the world. The conclusion that I came to is that I need to make them feel like they know who we are. That is why I put both my and my wife’s pictures on the about us page and put a facebook module showing that we have friends. I also put a map of customers who have ordered from us (I don’t know if you noticed that). I am also planning to translate the site to Spanish. Something else that I see you spoke about. I also plan to produce some videos featuring myself and my wife to make people feel even more like they know us.